5 years ago, a world-breaking record of the legendaries' battle happened in the peaceful region of GINOA Region. 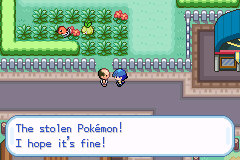 A 10-year-old guy sealed himself along with the disaster trio in an unknown dimension to save the entire Pokémon World. There is no known information on what happened to the kid, but one thing is for sure, he is now a Legend. The first day of the player of becoming an official trainer takes place in the quiet town of Criscanto. 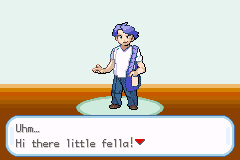 Prof. Jimwell Beckett, a well-known Pokémon Researcher, is about to give a first Pokémon partner from Kalos Region to the Player and to his childhood friends, Wilhelm and Hazel. However, a newly-formed team is starting to do evil deeds in the region, they named themselves as "Solar Team", the blazing trainers in a hood. Their intention is to separate Pokémon from its power, turning all Pokémon to normal, because they believe that trainers are overusing the power that has given by the creator to their Pokémon. When Solar Eclipse occurs, the Sun God will be awakened, and controlling it is the only way to fulfill their goals. But that's all for now. Aside of the Solar Team, an old gang has been reborn and is now led by a guy named CLINT. It was revealed that he is the father of the 10-year-old guy. The gang is LUNAR TEAM. Their aims are to collect the Ancient Orbs and use it to awaken the full power of the legendary Moon God, Mnemon. Awakening it will bring Lunar Eclipse to the Pokémon World. Months later, Solar Eclipse will be seen. If the plans of Solar Team and Lunar Team become one, the chaos that happened years ago will happen again, but this time, it will be more destructive. Are you strong enough to fight and stop the teams? Ginoa Region and the other Two Regios: Yes you are reading this right. There's 4 actually, Ginoa Region is Divided into two Regions: The west and the east. 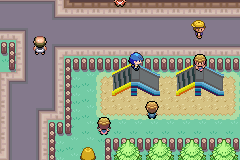 City Kahuna and Gym Leader: There will be 16 Gym Leaders in Ginoa Region and 12 Kahunas. Expect for challenges and a wonderful reward. HMS will no longer be available as it will be changed into Poke Ride. Gen. 1 to Gen. 7 Pokemon plus Ginoan Pokemon and forms: Catch 'em all folks! Well, it's not just ALOLA Region that has Pokemon from before's generation with Alolan form/e. This also adds the FAIRY and MANA type. Updated Moves and Move Effects: Almost all moves are ported to PST but all are coded. 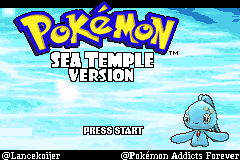 By this, Z-moves are also implemented but the coding is not yet finished. 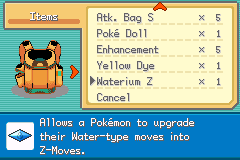 This is not really similar to the SNM's Z-move but the concept of upgrading moves into Z-move, Z-Crystals and Z-ring are still part of the concept. Updated Items: Find and Obtain many items everywhere. There are added items like Mega Stones, Z-Crystals, Plates and etc. Updated Abilities: Some abilities from Gen. 4 to Gen. 7 had been implemented. Some of the added abilities are Pixilate, Normalize, Snow Cloak, Moxie, Protean, Soul-Heart, Innards Out and etc. Lance also coded a new ability called "Survivor" which restores half of its HP once upon fainting. 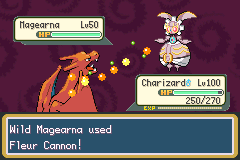 Mega Evolution: Witness the true power of your Pokemon. 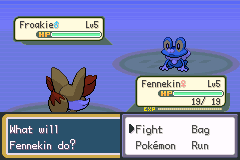 1)"Who is the the pokemon in the question box" in Honneyberry's gym?